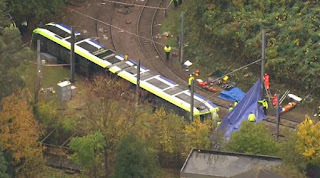 At least seven people are dead and more than 50 are injured after a tram derailed and overturned in south London yesterday morning. Emergency crews rushed to the scene after the two-carriage vehicle flipped over near Sandilands station in Croydon shortly after 6am. The London Ambulance Service said it had transported 51 people to two local hospitals - some with serious injuries - following the horror crash. Yesterday afternoon, police confirmed they had arrested the tram driver - a 42-year-old from who is yet to be identified - on suspicion of manslaughter. Investigators said the vehicle was travelling at a 'significantly higher speed than is permitted' on the bend, which has a 12mph limit. It has been claimed the driver blacked out at the controls. London mayor Sadiq Khan warned the death toll 'may well increase' after the derailment, with eight people said to have 'life-threatening' injuries. Traumatised survivors described the scene as 'total carnage' and 'like something out of a film' after the packed tram crashed at rush hour. One mum told of how her son had called her to say a dead body had fallen on top of him. Aerial footage showed the devastating aftermath of the deadly derailment, while witnesses described hearing a "loud bang. The tragedy is being probed by BTP and the Rail Accident Investigation Branch (RAIB).